Free Shipping in Canada on Retail orders over $159.90!! F2T - are used to treat small engines under 3.5 hp, and all hand-held outdoor power equipment. F5T-1 - are used to treat small engines over 3.5 hp such as motorcycles (under 350cc , 25 HP Max), outdoor power equipment, small outboard motors etc. The in tank unit, is simply placed in the fuel tank of the engine to be treated. ***As a stabilizer you may use one F5T-1 unit for each six gallons (27 liters) of fuel tank capacity. The F5T-1 in tank unit can also be used in conjunction with any in-line Fitch unit when fuel containing higher than normal contaminants or excess water is present. As well, in seasonal and stationary applications, where the fuel lies stagnant for long periods, the catalyst will help keep the fuel fresh. NOTE: You must use both units in one vehicle to attain full results!! NOTE: "Snowmobiles with under 10 gallon tank and under 150 HP Require 1 F5T pack." 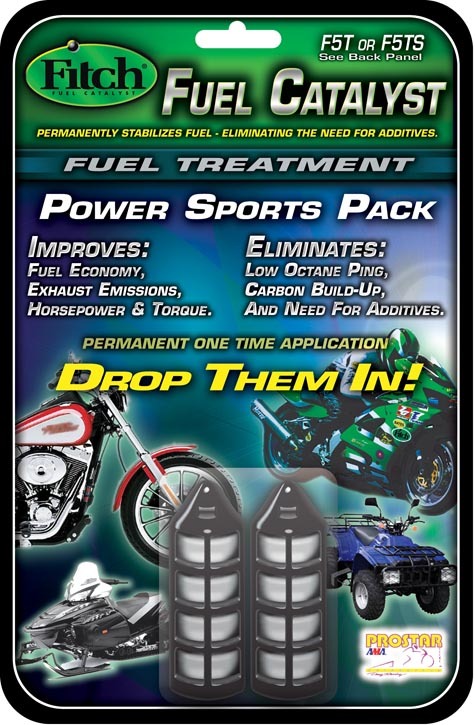 "Snowmobiles with over 10 gallon tank or over 150 HP May Require one additional F5T-1 Unit"
Casual recreational riders should install the F5T in the fuel tank directly. ***Competitive Race Applications / very aggressive riding over rough terrain/jumps (such as professional Moto Cross) should pre-treat a 10 gal fuel can with the F5T Fitch unit & fill their equipment with the treated fuel instead of installing directly in tank. Click here for Drop-in Systems for special Auto and Truck applications, Custom Cars and Hot Rods !! The "HO-5UL and HO-10UL Series Catalyst". They are specifically designed for Residential heating applications. "UL Listed" for safety and easily installed on furnaces by a Licensed heating technician. Click Here. The FHDG Heavy Duty Series Catalyst Units are specifically designed for Heavy Duty applications and are warranted for "500,000 miles or 10,000 hours". These units are designed for Transportation Engines, Construction Equipment, Power Generation and Industrial Heating/Boiler System Applications. For more information about these units Click Here. Note 1:Some Cars and Trucks containing aftermarket performance enhancing parts or exceedingly high horsepower may require larger size unit or additional drop in units. Note 2: For larger engines or higher fuel flow rates, contact the manufacturer for recommened application. Note 3: Automotive Hints and Benifits Q&A. Free Shipping in Canada on Retail orders over $159.90! 20% restocking fee will apply to any and all returned product Product must be accompanied by sales receipt and original packaging in original condition. Distributed in Canada by PMC Ltd. Copyright © 2015 PMC Ltd.